Bring on the Christmas spirit with this delicious recipe! 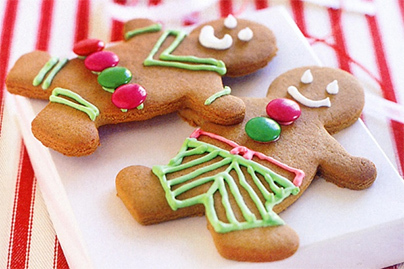 Gingerbread men are both fun and easy to make, and, what’s more, the kids will love them! Preheat oven to 180°C. Line 2 trays with baking paper (or lightly grease with melted butter). Beat the butter and sugar in a bowl until paler and creamy. Add the honey and egg yolk and beat until combined. Stir in the flour, fresh and dried ginger, mixed spice and bicarb soda. Turn onto a lightly floured surface and knead until smooth. Press dough into a disc. Cover with plastic wrap and place in the fridge for 30 minutes to rest. Place the dough between 2 sheets of baking paper and roll out until about ½ cm thick. Use gingerbread man cutter to cut out shapes. Place on trays about 3cm apart. Decorate using currants for eyes and nose, orange rind for mouth and raisins or sultanas for buttons. Bake in oven for 7-10 minutes or until brown (reduce time if you like the gingerbread soft). Remove from oven. Transfer to a rack to cool. Serve them to your kids with some warm milk and just watch that smile spread across their face! Have a Merry Christmas everyone!!! In our fast paced lives, a sustainable lifestyle shouldn’t be a struggle, but it sometimes is. Our online e-commerce provides the largest selection of natural, organic and eco-friendly products in India making it accessible and affordable to all. Founded by parents, NaturalMantra.com helps you choose from a wide selection of safe, healthy non-toxic products, all at one place delivered to your door! Not every product makes it to our virtual shelf, but the ones who do make it through our selection criteria.